I had always been dreaming about travelling and exploring new places and meeting new people and so, YHAI treks were the ultimate opportunity. The first step was to select the trek because every YHAI trek looks irresistible. In my case, as much as the over enthusiastic beginner in my mind believed that I could even climb the Mount Everest if I ventured; the truth was that I have a lung capacity of a two year old toddler. In other words, in any given group of people walking or running, I would be the first one to feel breathless and the start demanding for rest. Given this fact, my job of picking a trek became very easy. I chose the trek to HAMPTA CIRCULAR going by the YHAI description of it being a ‘Beginners Trek’. I booked the trek with a friend of mine on the deal that we would go on the ‘trip together but alone’. For beginners who want to venture out alone, I would suggest you to take someone whose company you would enjoy but also, who would let you alone to enjoy personal moments with yourself because trust me, the trek is going to be filled with such moments that are best enjoyed in solitude. The base camp for our trek was at 15 Miles (yes, it’s an actual place) which is around 3kms after Katrain and 6kms before Manali. We took a bus from Delhi and landed there early morning at around 5 only to almost freeze to death. There was instant teeth chattering and smoke coming out of our mouths the minute we stepped down from our bus. Apparently, our jerkins were only prepared for Chennai’s “winter”. So, what did we end up doing the first day? Go shopping for sweaters, jackets, gloves and scarves! And what did we realize on reaching Katrain? The market closes every Tuesday and therefore, there were hardly any shops open (Hail, Murphy !!). We walked all through the town and managed to get all that we needed from a few shops that were open. YHAI organizes orientation sessions and a cultural night to ensure socialization among the team members. We were a batch of 55 ranging from the age of 15 to 75 years old. We were the HC-08! It was a team with a variety of talents filled with super friendly and super cool people. Being around them gave me a whole new perspective to life. We had two acclimatization walks that served as a preview as to how the trek would be and also meant to be a practice session. Having successfully completed the acclimatization walks, I confidently left for the trek the next day only to find that the acclimatization had not at all prepared us for what we were about to face :P It was a matter of minutes before I felt breathless and started taking breaks every five minutes! But, the spirit of HC-08 pulled me forward and I managed to stay in the middle of the group till we reached our first camp at Tilgan. There was this stick that I stole from a friend thinking it would make the walk and the climb easier. But, this is how it actually turned out. 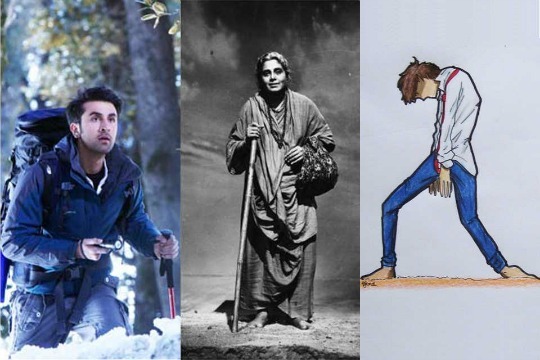 At the start, I used it like how Ranbir does in ‘Yeh Jawaani Hai Deewani’ only to proceed to completely bend on it like “Avvaiyaar” and the final stage where I was too weak to even lift the stick that I dragged it along like the villain drags the hammer in the movie “Yaavarum nalam(Tamil)/13B(hindi)”. For those who didnt know all the movie and historic references is a pictographic reference below. From Here to Here !! All that I and my friend ever told during the trek was “What were we thinking?” and “Why are we doing this to ourselves?”. But, every time I looked at the mountains, that seemed to be waiting for us to come, I forgot what I had been complaining about or the fact that I had miles to go until I reached there. All that I told myself was “let’s do this!”. There is this one particular point where the snow clad peaks appear at your eye level and you can simultaneously spot Manali miles below you with the magical Beas running across the city. This is one of the best sights that you can etch in your memory and hold on to for throughout your life. After sufficient rest points and a long lunch break in a beautiful grassy patch of land with a spectacular view where we even had a hilarious costume session, we reached our first camp at Tilgan. All the camps of YHAI are put up at the most exotic scenic points that you would not be able to decide which was the best. At Tilgan, on the one side, we had a view of the enthralling snow clad peaks and on the other side, we could see dense forests equally shared by tall trees and short grass. We spent one night at Tilgan and I spent the night star gazing. Some of my friends were even lucky to spot shooting stars! The next day, we were headed to our highest camp Sarotu. I was under the blissful imagination that the first day’s trek had me physically prepared for the second day. But, clearly as always, I was wrong :P. As we started heading upwards, the oxygen levels were lower thereby making my already pathetic breathing worse. I am proud to say that I had the loudest breath in my team. If somebody behind me got lost, they could literally come back on the track just by following the sound of my breath :P This somehow amused my team mates who seemed to thoroughly enjoy the climb at the cost of my breathlessness! 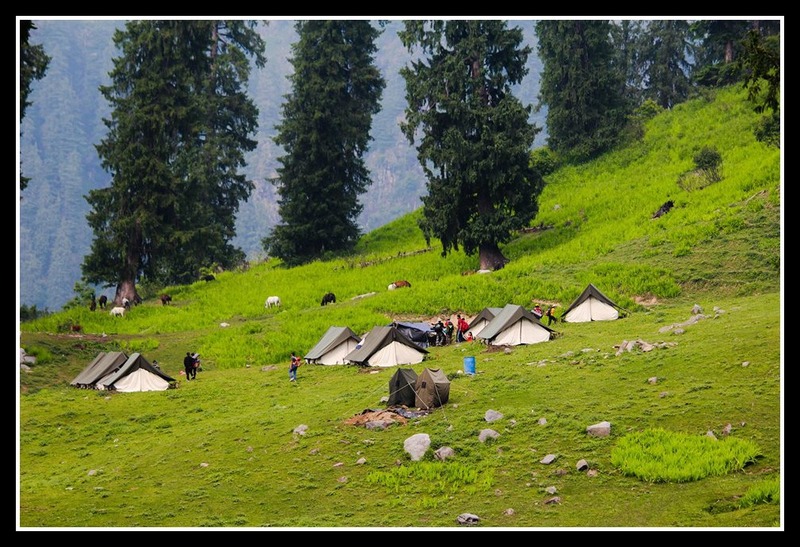 The most beautiful feature of Hampta trek was that it struck the perfect balance between all elements of nature. We were headed towards the target of snow peaks. But, the route included crossing dense forests, flat green lands and most importantly, river crossing! River crossing gives the perfect adrenaline rush given the force of the water and the slippery rocks. For those who remember “skipping stones” from Takeshi’s Castle, the only difference in this case is that it is “tripping stones”. Try to step on the wrong stone and it starts to roll away. The next most unforgettable feature of the water is that it is always icy cold. I got acclimatized to everything with course of time but for the temperature of the water. I spent sleepless nights just remembering that I had to brush my teeth with that water the next morning! How I missed the boiling hot tap water that we got in Chennai! But, the water is so pure and tasty that the only souvenir that I wanted to bring back home was the water! The trek to Sarotu starts on a very hectic note but it gets easier once you have reached the altitude. There are sufficient flat stretches where we can conveniently walk without much exertion. It is in this climb that Deo Tibba and Hanuman Tibba come into our clear view. Luckily, they were covered with snow at the time of our trek. You would be travelling parallel to the stretch of these mountains and therefore, at any given point, you can just stop and lose yourselves at the beauty of what you are seeing. There were moments when my eyes got all teary with realization of nature at its best. There were sights that I did not want to take my eyes away from. I memorized every inch of such views so that I can relive those moments at any point in my life. For me, Sarotu was the most beautiful camp in the entire trek given the strategic location of my tent in particular. I just had to open my tent to get a spectacular view of the entire mountain range filled with snow including Deo Tibba and Hanuman Tibba. I booked my seat at the opening of the tent and did not move an inch for I don’t know how long just gawking at the peaks. Listening to your favourite music with the peaks looking back at you is an experience that you need to live through to believe! The next day was our trek to the highest point, Deo Tibba and the previous team assured us that there was enough snow for us to enjoy. Our spirits soared high on hearing this. The trek sure was tedious but just like always, the magnificent view of the mountains will keep you going through steep climbs, a scorching sun and the slippery river walks. At the end of all this, lay my lifetime dream! The time had finally come when I could feel snow with my hands! I could play with it! We had snow fights or should I say snow wars? I had so many hard hits right on my head that I bid a secret goodbye to my family in my mind if at all I should die of a head injury. Then came the most amazing part! SLIDES! Train slides together, train slides that got derailed mid-way, individual zigzag slides, individual roller coaster slides and what not! The kid in me that had been longing for snow was more than satisfied and I decided to tick it off my bucket list! It is funny that at the same point where you find snow, the sun is so burning hot that all your clothes that got drenched in the snow will dry off in no time. But, this weather ended up giving a headache to a lot of my teammates and sun burns to a few who were not sufficiently covered by clothing or sun screens. But, a good sleep after returning was enough for curing the headache. We came back to Sarotu after successfully completing our “ascent” portion of the trek. That night, there was a heavy snow storm which ensured a fresh patch of snow for the next team! The next day, we headed towards Setan, the next camp and it marked the start of our descent. The route involved crossing a dense alpine forest full of vegetation. The forest excited me as much as snow did since I grew up watching Tarzan and Mowgli and always dreamt how amazing life in forests would be. At one point during the trek, I was walking on a corner of the mountain which marked the start of the forest with a river noisily flowing in full force below me and the snow clad peaks standing in front of me at a distance. Again, it was nature at its best! We were walking through the tall trees in a cloudy weather that kept warning us of approaching showers with leaves rustling below our feet. Although it was supposed to be a descent, we also had occasional climbs. We were blessed with the pleasure of light drizzles until we reached the base camp at Setan. At Setan, YHAI had arranged for a building accommodation wanting us to enjoy some luxury at the last part of the trek. But, what came next made us want to run back to our tented accommodations. The tents usually filled with 10 to 12 people always kept us warm at nights. The rooms in the building filled with just 6 people made it freezing cold and none of us could sleep that night. The building turned out to be quite the opposite of luxury. The next day was our descent to a village called Phirni from where we could go back to our base camp by buses. The day started with rains and we stepped out of the building only to find fog descending from the mountains and spreading in every possible direction. Visibility was going down by the minute. It was something that I had never before seen in my life. The showers continued only to make our descent super slippery! There were points where one foot of mine was forward but my other foot was stuck in wet mud. Nevertheless, the skates and the slippery falls only added to our merry and laughter! After all, I ticked off monsoon trek from my bucket list too! And finally, we had made it to Phirni and then, back to our base camp in 15 miles! And the first thing that I realized when I stepped into the base camp was that I was a changed person. 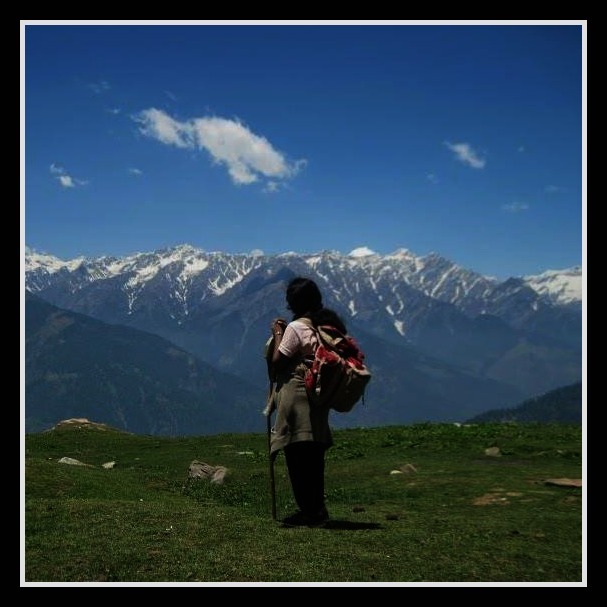 The trek had enriched me with a whole new outlook to life. For instance, the anxieties and worries that I had when I first entered the base camp seemed much smaller and solvable this time. The trek in some way made me feel better prepared and better equipped for the future that lay ahead of me. I have returned as a person with not only rich experiences but unforgettable memories that will remain treasured with me forever! I am going to call it the HC-08 effect! 1) Have your medical certificates and other reporting formalities printed prior. These facilities tend to be minimal and inconsistent in the smaller Himalayan towns and also much costlier. 1) Please put in some hours into training every day before you enroll for any rigorous adventure trip, so that you may enjoy the trip as best as possible. When your fitness is low, it is difficult to enjoy an adventure. 2) If your reporting camp sites are away from a town/city, please try to finish shopping before you start for the trip as much as possible.